PERFECT® G12 PRO Paper Cutter. This paper cutter is the highest quality, precision paper cutter we have ever tested. Right out of the box you will notice the quality of this machine. The blade is a hardened steel, razor sharp, extra long 12" blade. 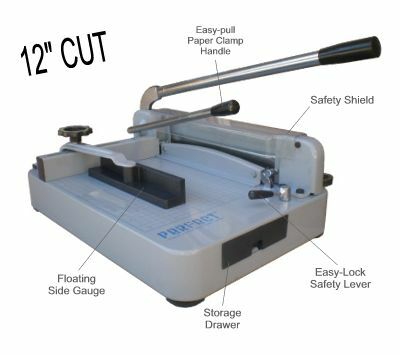 It will easily cut a stack of 20lb paper, 400 sheets high or approx 1.5". The blade lasts for hundreds if not thousands of cuts. However, should you ever need to replace the blade, this cutter is designed so that it is very easy to do. Unlike other heavy duty paper cutters that require you to disassemble the entire cutting assembly, the PERFECT® G12 PRO paper cutter has an easy replaceable blade. Simply use the included Blade Replace Handle to hold the blade while you remove the screws that hold the blade in place. The blade comes right off and a new one can be put on just as easy. This is a huge plus as most people who need the blade replaced on other heavy duty paper cutters will have to send it back to the manufacturer for blade replacement due to the high difficulty and danger of replacing other paper cutter blades. The PERFECT® G12 PRO Heavy Duty Paper Cutter is ideal for Schools, Churches, small and large Businesses, Print Shops and much more. Extra long cutting bar increases leverage - cut as much as 400 sheets of paper effortlessly! Easy to operate, sturdy, super heavy duty construction. Heavy gauge steel - cutter weighs 57 lbs - compare that to the competition. Safety shield to help prevent users from getting hands under the blade. Free accessories - spare tools, extra cutting pad and blade replace handle. Non skid pads for table top use. Professionally machined and assembled steel blade rail and blade assembly. Computer generated grid in inches (down to 1/8") for precise cuts. Surface protected with scratch resistant coating. Hardened precision steel blade customized at the factory. New innovative floating side gauge. Adjustable paper clamp - locks paper stack firmly in place, eliminating shifting and tearing. Easy-lock safety lever - prevents cutting until released. Easy one pull paper clamp handle. Pre-assembled and easy to use. MBKP International agrees to repair or replace, at its option, any defective part or component covered by this warranty, provided there is no evidence of abuse and we first receive written notice via email of a defect within the applicable warranty period. Wearable items are not covered under warranty. Wearable items include, but are not limited to; blades and cutting pads. This warranty extends only to the original purchaser. MBKP International makes no further warranty of any kind and specifically disclaims any warranty of merchantability for a particular purpose. 1-30 days from date of purchase - We pay all shipping charges. 30 days to end of warranty - You pay shipping to us, we pay shipping back to you. After warranty has expired - You pay all shipping charges. Paper Cutters can be returnd for a refund for 30 days from date of purchase. We have a 15% restock fee for any item that is returned for a refund. Buyer is responsible for all return for refund shipping charges. on 2/28/2013 Great Paper Cutter! After a bad experience with another guillotine that turned out to be a poorly made Chinese knockoff that failed, I decided to upgrade to this model. I'm happy to say that this one is a genuine product that, for the most part, performs well. It pretty much does what it was designed to do without too much effort. The lever operated paper clamp is so much easier and faster to use than the earlier one that had a hand crank. The paper fence has a silicone rubber insert on the underside that helps keep it from shifting when in use. The fence is easy to remove so one can clean friction inhibiting paper dust from the insert. The release for the cutting lever lock that keeps the blade from falling before one is ready for it to is located on the front of the machine where it is easy to get to. Unlike the previous machine, this machine has a rod for a guard to help one avoid getting fingers into the blade (which is wicked sharp!) plus a removable plastic guard that makes it harder to get one's fingers in harm's way.